India’s Tata Motors on Thursday unveiled its much anticipated $2,500 car, an ultra-cheap price tag that brings car ownership into the reach of tens of millions of people. But critics worry the car could overwhelm the country’s roads and create an environmental nightmare. 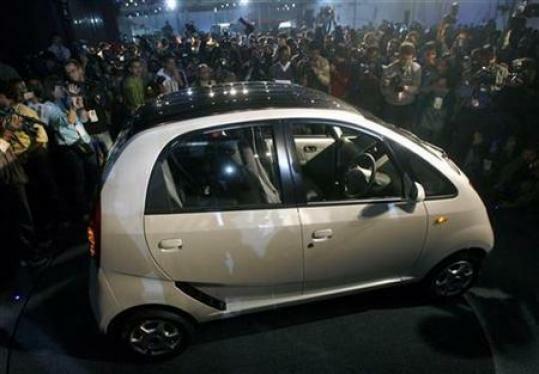 Company Chairman Ratan Tata, introducing the Nano during India’s main auto show, drove onto a stage in a white version of the tiny four-door subcompact, his head nearly touching the roof.With a snub nose and a sloping roof, the world’s cheapest car can fit five people — if they squeeze. And the basic version is spare: there’s no radio, no passenger-side mirror and only one windshield wiper. If you want air conditioning to cope with India’s brutal summers, you need to get the deluxe version. While the price has created a buzz, critics say the Nano could lead to possibly millions more automobiles hitting already clogged Indian roads, adding to mounting air and noise pollution problems. Others have said Tata will have to sacrifice quality and safety standards to meet the target price. The chairman, though, insists the car will meet safety standards and pollute even less than motorcycles, passing domestic and European emission standards and averaging about 50 miles per gallon (20 kilometers per liter). Chief U.N. climate scientist Rajendra Pachauri, who shared last year’s Nobel Peace Prize, said last month that “I am having nightmares” about the prospect of the low-cost car. The basic model will sell for for 100,000 rupees — $2,500 — but analysts estimate that customers could pay 20-30 percent more than that to cover taxes, delivery and other charges. Tata has long promised that he’d create a 100,000-rupee car, a vow that was much-derided in the global industry but created a frenzy of attention in India. On Thursday, nearly every news station covered the unveiling live. “A promise is a promise,” Tata told the crowd. The company has said they expect the car to revolutionize the auto industry, and analysts believe the Nano may force other manufacturers to lower their own pricing. French automaker Renault SA and its Japanese partner, Nissan Motor Co., are trying to determine if they can sell a compact car for less than $3,000. For now, the car will be sold only in India, but Tata has said it eventually hopes to export it. The Nano could become the basis for other similar super-cheap models in developing markets around the world. “The cheaper and cheaper vehicles become, the quicker those pollution levels will increase,” Leather said. Previous story Can Words Be Recycled?